Unit from Smithsonian multidisciplinary ocean curriculum. 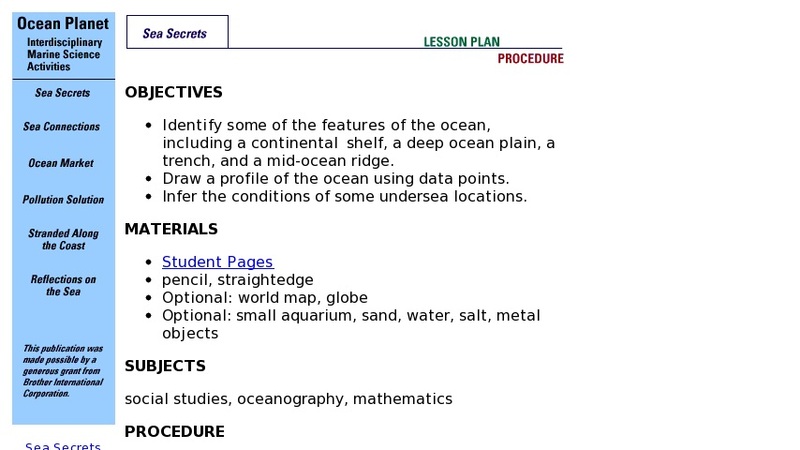 Lesson plan focuses on ocean bottom features including continental shelf, deep ocean plain, and mid-ocean ridges. Students study the discovery and mapping of seafloor features, learn to read seafloor maps, then create a map of Atlantic seafloor features. Unit includes: background essay; teacher instructions; maps and forms for student activity; discussion questions; all online in PDF format. Resources include online version of Smithsonian Ocean Planet exhibition.